Glow sticks (also called light sticks) are tons of fun and a must have item for any rave or club. Just crack your glow stick and start dancing. 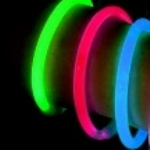 Choose five minute ultra high intensity or standard intensity, long lasting glow sticks. Save some cash for the club cover! Stock up on bulk glow sticks. Just 83 cents each by the dozen in assorted or single colors. These super high-intensity five minute glow sticks are designed specifically for users who want an insanely bright light...for 5 minutes. The same high quality 5 minute super high-intensity 6" lightsticks you've come to love - now in White & Yellow! The new GREEN 5-minute super high-intensity 6" lightstick. These Ultra High Intensity orange glowsticks are just as bright as the CYALUME glowsticks but cost less!